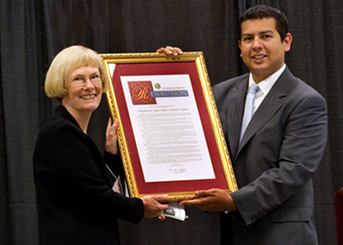 The California State Senate recognized and commended CASAS during the 2010 CASAS National Summer Institute for its contributions to the field of adult education and literacy throughout California and nationally. During the Summer Institute, more than 500 attendees from 27 states and seven countries were honored to have CASAS recognized and commended as the result of a resolution of the California State Senate introduced by State Senator Denise Moreno Ducheny. Sharing in this honor and recognition are hundreds of professional adult educators who have collaboratively helped develop CASAS over the years. A special State Senate resolution recognizes the significant contributions and professional service CASAS has made to the people of California and to the field of adult education and literacy in California and across the nation. The award was presented by David Alvarez, Community Liaison for Senator Ducheny, to CASAS President Pat Rickard who gratefully accepted the honor — embodied in a commemorative plaque — on behalf of CASAS and its state and national consortium partners.